Military Equipment Denmark was founded in 1987 by Leif Braae and today the company is Denmark’s leading supplier of products and services to clients in the public and civilian defence and security markets. Over the years MED has developed its own product range, mainly for shooting ranges. Military Equipment Denmark provides a wide range of products – from military equipment such as armoured vehicles, environmental bullet catchers, shooting ranges and other types of target devices to general security devices such as personal protection equipment and other defence related products. 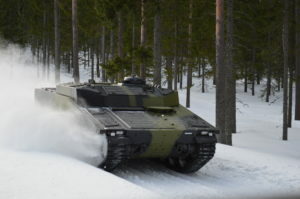 In the process Military Equipment Denmark has also developed its own products. Our solutions are characterized by careful use of resources and common sense. We cherish a strong focus on quality, the environment, and personal security. We specialize in environmentally friendly shooting range equipment and secure construction of indoor and outdoor shooting ranges – for example featuring high quality target lifting system and bullet catchers containing recirculated rubber granulate, which offers optimum protection of the environment. For this purpose, we have developed the most environmentally friendly cleansing equipment in the market. Military Equipment Denmark also provides a range of additional services in the form of training, professional advisory services, qualified consultancy services, product development, and a highly versatile service concept complete with installation, maintenance, repair and modernization of shooting range equipment and establishment, among other to the Danish armed forces. Since 2007, Military Equipment Denmark has had its headquarters and production facilities in Regstrup, a short distance from Copenhagen, the capital of Denmark. We treasure our technically competent employees who are all set on delivering safe and fast high quality services – and who not least thanks to their professional product know-how create complete, sustainable and tailor-made solutions resulting in optimum customer satisfaction. Over the past years Military Equipment Denmark has been expanding, in order to secure a wide and strong platform for its operations. As an example Military Equipment Denmark established United Military Services A/S in 2013 as a joint venture between 4 partners (see below for further details). This allows us to offer complete solutions to the defence and security markets, which makes us your all-inclusive professional business partner when it comes to procuring new items or repair and maintaining defence equipment. United Military Services A/S provides efficient and cost-effective maintenance, repair, and modification services of all types of military vehicles and equipment, old and new. Among others, the United Military Services services include technical support as well as training and education, a.o. Read more about United Military Services A/S. We welcome you to our website. Here you are sure to find useful information about some of the products we produce and distribute. You might also find the links provided interesting. Further, you can find information about the agencies we have been entrusted with in addition to information about our business partners.